If you come to the Sacred Valley, you need to see Machu Picchu! If it’s within your budget, I couldn’t recommend it more. There’s a reason people travel from all over the world to visit this sacred site, one of the 7 Wonders of The World. I’ve lived here on and off since 2013, and I’ve visited 5 times already. There’s so much magic, energy, power, and hidden teachings in this land. I’ve seen a “non-spiritual” person (ie. a doctor, very left brained & analytic) have her first direct experience with something she would call spiritual, on my first hike to Machu Picchu. There’s a reason these mountains and this sacred land were chosen by the Inkans, to be their home. How did the Inkans have technology and awareness far beyond what their archeological age says they “should” have? I feel one thing is certain, they were spiritually far more evolved and connected than we are. All point to that truth. We have so much to learn from them. Go so deep, and I continue to learn so much, living in this land, surrounded in this energy. This land, the ancient people of this land, and everything here, is not only breathtakingly beautiful on the outside, but can be the most powerful catalyst to internal revelations and transformation, that I’ve ever experienced. That’s why we’ve chosen this land to create our healing center, and that’s why I couldn’t recommend visiting Machu Picchu more. Especially with how we’ve designed the trip to Machu Picchu, which is after your retreat. During your retreat, you will be going so deep, clearing so much, and energetically opening yourself up to feel, see, experience and understand so many depths of reality that are often invisible and unseen to many people. 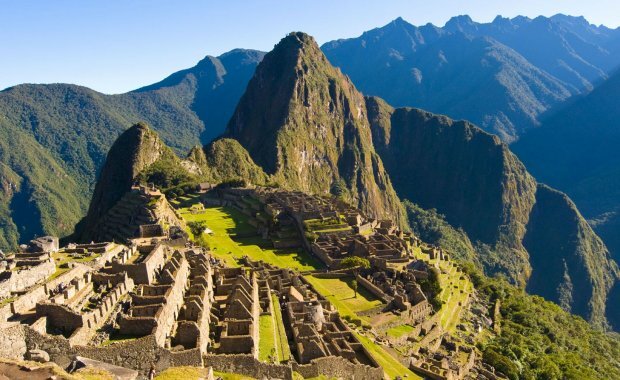 In this state, to visit Machu Picchu, would be the most powerful time to go. I can’t promise you anything deeper than sheer, breathtaking beauty that is this sacred site, but personally, I’ve had such transformation, heart-opening, divine remembering, and internal revelations and shifts, at Machu Picchu. This is why I keep coming back, and why I want to encourage those who can afford it, to visit this special land. – On the last day of the retreat, you will stay at our land, and enjoy some much-needed down time for rest and integration. – You will sleep at our land, in the room that you enjoyed the whole retreat in, so there’s no need to move or transport anything. – The next morning, after an early breakfast, you will be transported by taxi to Ollantaytambo, which is where the train to Machu Picchu departs from. – You will arrive in Aguas Calientes, which is the small town at the base of Machu Picchu around 9am, and you’ll go straight to the Machu Picchu ruins. Or, you can take a bus up the mountain, which only takes 20 minutes, and is included in the price of the retreat extension. – At the ruins, you’ll have a guided tour explaining the history and the amazing story of the Inkans and this sacred site, which lasts about 2 hours. Note: Personally, I’m not into the whole tour / touristy thing, but I really enjoyed it, as this culture, their people, and all they’ve left behind, is so fascinating, and infinitely powerful. – After the tour, you’ll have about 3 hours to roam around, (remember your camera!) and then you can enjoy the bus back down the mountain, to Aguas Calientes. Note: Since there’s quite some time between your breakfast and lunch, we’ll also provide you with a bagged snack, for while you’re at Machu Picchu. – When you arrive back in Aguas Calientes, you’ll have about 2 hours to roam around and have lunch (on your own, or with other people from the retreat who’ve booked this extension – up to you! ), before you catch the last train back to Ollantaytambo. – There will be a bonfire and tea, as you enjoy your last night with the family you’ve made here. – The next morning, we’ll prepare breakfast for you, and then drive you to the Cusco airport to catch your flight back home. So the $450 includes two more nights at our land, the entrance ticket to Machu Picchu, your train ticket, all transportation, the guided tour of the ruins, all meals (except for the lunch you have at Aguas Calientes), and most importantly, the much-needed time to integrate, before you fly back home. And honestly, if you try to organize this yourself, it will very likely end up costing more. We don’t do this to make money, we do this to help you out with organization, and to make this beautiful experience available to you. Almost all of the $450 is going towards the expenses for these additional 2 days. If you’re interested in this, just click “Add to Cart” below, and follow the steps through the checkout process. We look so forward to meeting you in person, and even if you can’t afford this retreat right now, if you know you want to come, you can book your flights to make space for this retreat extension (more info below), and then either pay the $450 through this page before the start of your retreat, or bring $450 cash with you, and we’ll get you taken care of at the land. So grateful for this journey, excited for you! – If your retreat ends on a Friday, book your flight leaving Cuzco, back to Lima, on Sunday afternoon. – If your retreat ends on a Sunday, book your flight leaving Cuzco, back to Lima, on Tuesday afternoon.